UNSTOPPABLE OWLS: KSS IS VALLEY VOLLEYBALL CHAMPION! – Censor This! 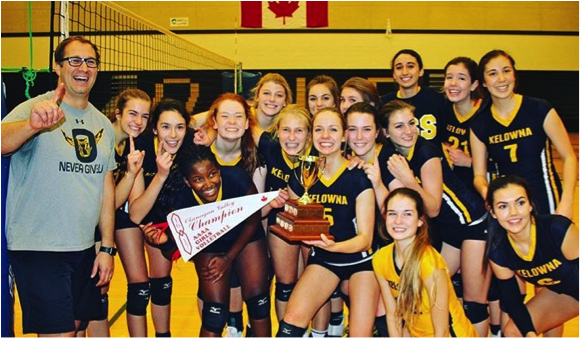 UNSTOPPABLE OWLS: KSS IS VALLEY VOLLEYBALL CHAMPION! From left to right: coach Tony Sodaro, Zovya Wasylyk, Stephanie Temme, Bianca Raiva, Sadie Taylor-Parks, Kennedy Dickie, Carly Tremblay, Janel Filipiak, Angelina Munson, Makenna Wahl, Jayne Reid, Nathalie Demers, Maya Ringer, Georgia Chalmers, Sarah Demers, Sarah Watson and Camryn Allard. After being City Champions, the AAAA senior girls’ volleyball team are Valley Champions for the 11th year in a row. The team beat Penticton in the finals and earned a ticket to Provincials, to be played next week in Vancouver. According to Nathalie Demers, libero of the team, the main difficulty was defense. “We had to change [our] mentality to win that game,” she said, “We had to find our reset button,” added Makenna Wahl, middle blocker, and that reset button was found when coach Sodaro called the time out at the end of the second set. “We underestimate that game since the very beginning,” she concluded. Mr. Sodaro, head coach of the team, explained how important it has been to keep up the pressure during these two-months-and-a-half-of trainings to prepare the girls in the best way possible. According to him, taking part in the big tournaments in BC and putting the girls in critical situations, urged them to give everything they could for the team, adding how important it is to keep up the competitiveness and intensity of play. Sodaro also believes the KSS Owls are probably one of the biggest, fastest and strongest team in BC, which has led to their ongoing success. However, the girls weren’t just physically prepared, but mentally as well, thanks to the mental training sessions designed to help them overcome uncomfortable situations on the court.